Move over Whole Foods and Trader Joes! There is a new marketplace in town. Broadway Market, located at 468 Broadway Street in Cambridge, is rapidly gaining the support of new foodies every day. Broadway Market originated in 1995 as a full range market. From organically grown produce to hot, ready-to-eat specials, Broadway Market continues to delight customers by offering high quality, fresh products. George Hickey, the manager of Broadway Market, explains, “Broadway tries to cater to everyone because it is a small neighborhood grocery store.” Although each customer enjoys something special at the market, for me, it’s the vast array of gluten-free items that catches my eye. So what does gluten-free even mean? Gluten-free food does not contain the protein gluten; this protein is found in grains such as wheat, barley, rye and triticale. Some research suggests that gluten-free foods can potentially help decrease symptoms of a variety of conditions, such as migraines, allergies, immune diseases, and other chronic diseases like Diabetes, Crohn’s Disease, and Rheumatoid Arthritis. In 2004 at age 13, my brother was diagnosed with Celiac Disease, an autoimmune disorder in which the consumption of gluten leads to damage in the small intestine. Since my home pantry was always full of gluten-free goodies, I started to eat a gluten-free diet with my brother and have personally felt healthier ever since. At first, there wasn’t really a variety of gluten-free food items available, but over the years the gluten-free diet has become somewhat of a fad, and gluten-free food has become extremely popular in restaurants and grocery stores worldwide. When I first came to Harvard, I was worried that I would not be able to find a market that sells all of my favorite gluten-free foods, but then while exploring campus, I luckily stumbled upon Broadway Market. In the back of the market, there is a whole aisle solely dedicated to gluten-free items, indicated by a black “GLUTEN-FREE” sign on the aisle. According to the manager, George Hickey, Broadway Market completed the addition of gluten-free aisle about 18 months ago. With gluten-free crackers, bars, noodles, cereal, to cakes and cookies, this marketplace has become my new favorite spot. If you think gluten-free items are bland and tasteless, just try a few of the items at Broadway Market, and you will see that gluten-free food can be quite delicious and flavorful. Sometimes gluten-free items tend to be more expensive than their counterparts, but for some, the benefits outweigh the price. My two favorite gluten-free go-to foods sold in Broadway Market are the Glutino chocolate wafers and salted pretzels. The perfect combination of sugary and salty, these two snacks taste amazing! In addition to selling delicious food, Broadway Market is much closer to most locations on Harvard’s campus than Whole Foods or Trader Joes. The market is conveniently located on Broadway Street near Annenberg, making it an easy stop between classes. And don’t forget about the full service made to order deli, soup bar, homemade sushi, and a hot entrée station, which offers many gluten-free items daily. Furthermore, the customer service is spectacular, and the staff always make great recommendations on new gluten-free items to try. The manager is not only helpful in guiding his customers to the items they desire, but will also order items for any special diet a customer may have. So if you are ever in the mood to experiment and try gluten-free food, or are already on this type of diet, check out Broadway Market. 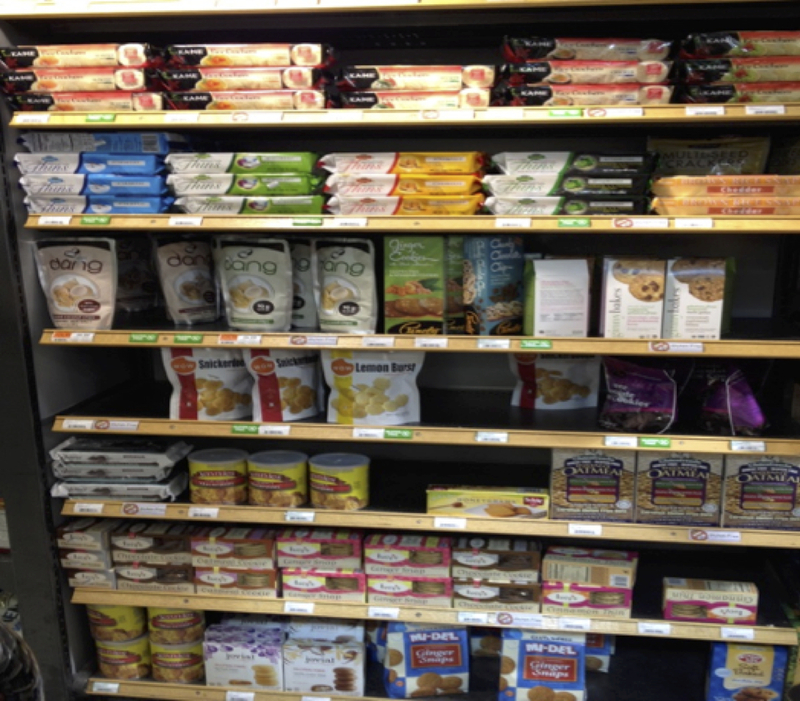 It is not just a corner grocery store, it’s a gluten-free lover’s heaven.